Childhood coach Rajkumar Sharma is the only person I am scared of a good scolding. I can't say anything to him even now and it comes from respect, tell cricketer Virat Kohli. For Virat Kohli, loyalty is paramount in relationships and that is why he believes that his bond with childhood coach Rajkumar Sharma and his IPL team Royal Challengers Bangalore is forever. Kohli revealed the emotional side of him at a launch of a new book on him 'Driven' written by veteran journalist Vijay Lokapally. "In relationships, I always look at loyalty. From 1998, I had only one coach (Rajkumar Sharma) and that's never going to change. I have played for one franchise in the IPL (RCB) and that's also never going to change," Kohli said at the launchof a new book on him. Sitting alongside legends like Kapil Dev, Virender Sehwag and Anil Kumble, Kohli revealed that even now when he is atthe height of his popularity as an international cricketer,one person he is scared of is his coach Sharma. "He (Sharma) is the only person I am scared of a good scolding. I can't say anything to him even now and it comes from respect. And it's always good to have someone like that,"said Kohli. 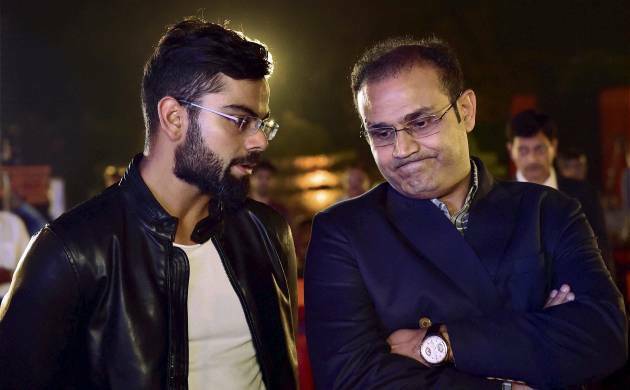 Virender Sehwag, who has now become a rage on micro-blogging site twitter regaled the audience with ananecdote from Kohli's formative years with the Delhi Ranjiteam.Sehwag remembers it even more as he was told that thisnew kid will surpass him. "It was Pradeep Sangwan who came and told me "Bhaiyaa, ekladkaa hain jo aapko bhi peeche chhor dega" (Brother this boywill even surpass you). I was curious to know who this boy is," Sehwag said. But Sangwan's praise for his India U19 teammate was not amisplaced one, Sehwag realised later. "This was a match where Virat powerfully drove the ball.There was both long-on and long-off and yet the ball raced tothe boundary and I knew he was talented. But he also remainedhumble all these years." For India's chief coach Anil Kumble, what attracts himapart from his inspirational leadership is Kohli's ability tobe flexible in certain situations. "I love the way he prepares for his matches. Not onlydoes he lead by example but when he makes a mistake, he hasthe honesty to admit it. He (Virat) would come upto you andsay 'Okay I have made a mistake. Can we discuss?' I believewhen he will look back at his wonderful career, he will bereally proud of his achievements," said India's highestwicket-taker in both formats. Former Team Director Ravi Shastri said, "Virat is alreadya great Indian cricketer and on his way towards becoming oneof the all-time greats that the world has ever seen. It was aprivilege to be a part of that dressing room and whatattracted most was his simplicity," said Shastri. World Cup winning captain Kapil Dev lauded Kohli'sfitness and then had an advice for him. "It's not only about playing cricket but one also needsto have a sense of humour. You need to have the ability tolaugh at yourself," said Kapil.